The Blitzwolf Smart Soundbar is one of the best Bluetooth Smart soundbars on the market today. This product offers a very unique design that you will not find anywhere else. A combination of metal and wood on the surface brings elegance and beauty to what normally is just a plain type of product. We thought we would tell you more about the Blitzwolf Smart Soundbar. Whether you are looking at this product for yourself or as a gift, it is definitely one of the best soundbar options out there. A lot of people might think that the unique metal and wood design is the most appealing thing about this device. In reality, the thing you should be most impressed about is the sound quality with this soundbar. 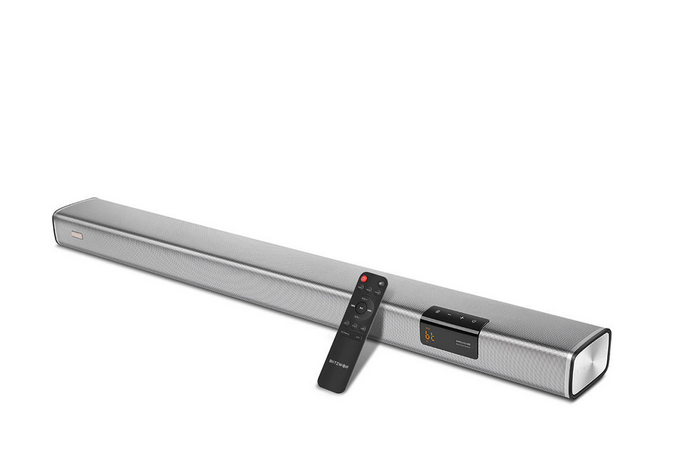 The Blitzwolf Smart Soundbar gives you a full-frequency sound experience. You will notice that while listening to something through this device, it makes it seem like you are right there in the action. There are six speakers in this product and it works on a 2.1 audio channel. There are 20 core filaments for treble and also a subwoofer is part of the soundbar. The 5.2 extended stereo offers you some of the best high fidelity sound quality out there today. 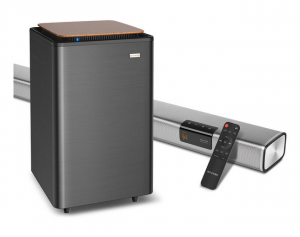 Speaking of the subwoofer, it is designed so that you can use either a wired connection or wireless connection. 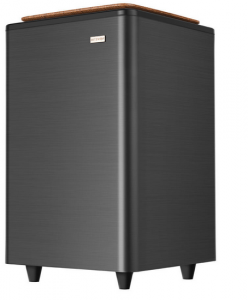 This subwoofer will give you an even better sound experience, and it also enhances the syllable rhythm. In the Blitzwolf Smart Soundbar, you will also have a 60W audio power amplifier, which was developed by Texas Instruments. The subwoofer and the amplifier help bring the sounds to life. It also provides you with an incredibly realistic sound experience not found on other similar devices. With the Blitzwolf Smart Soundbar, you will have multi-scene mode available to you, which really brings you straight into the action. If you are watching the news for example, you can click over to the news mode. There is a sports mode too, which is great for getting the best audio quality possible if you are watching a sporting event. If concerts are more your thing, switch over to the music mode for an immersive music scene. Lastly, there is a movie mode that allows all of the sounds of the movie you are watching to come to life. The Blitzwolf Smart Soundbar also supports Bluetooth version 4.2, which makes for a quick and easy wireless transmission. 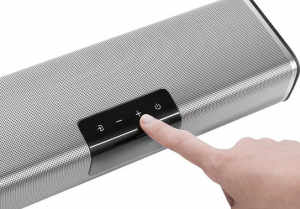 On the soundbar itself, you will notice it uses a touch screen that offers a pre-display and top-touch screen. If you turn the soundbar off, it will automatically remember which volume level it was on before it was powered down. This allows you to remain at the same volume levels when you turn the soundbar back on. We also really loved how all of the popular audio connections out there are supported with this device. You will find a bass extension port, auxiliary port, optical port, power port, coaxial port, and the normal USB port on this device. All of the popular audio connections that other devices use are supported. This means you will not need to purchase a connector or any other item in order to run the this item with the devices you want. You also can use the Bluetooth option for a wireless connection if that is what you prefer. There is also a smart power mode on the Blitzwolf Smart Soundbar. This allows the soundbar to turn off or on automatically when your television is turned off or on. The smart power mode will also remember the EQ mode that you had selected. It will go back to that mode when you power the system back on. Even cooler is that a moderate volume level is automatically detected and used. 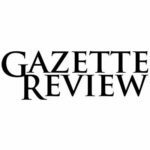 That means you will no longer have to find that moderate volume level yourself. We love that this product will adjust and detect the moderate volume level automatically. The Blitzwolf Smart Soundbar can be purchased for 15 percent off the retail price by clicking right here to head to the Banggood website. When you go to checkout, you will need to enter the coupon code: 15SDB2 in order to get the 15 percent off deal. You also can choose to purchase this product through the official website. The price is around $150 for the Blitzwolf Smart Soundbar. That is not a bad deal at all because the sounds that come from this device make it seem like it was much more expensive. For $150 you will be hard-pressed to find another high-quality soundbar such as this one. It is also aesthetically pleasing. The metal and wood combination provides you with a beautiful piece you will not mind displaying in your home. When it comes to the weight of the Blitzwolf Smart Soundbar, it is also fairly lightweight. This product weighs around 8.8 pounds, which is sturdy but not too heavy to be annoying or anything like that. 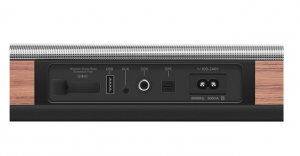 You will be able to carry this soundbar from one place to the next if that is what you desire. It will not feel like you are lifting a boulder like some other similar products out there. There are some other lighter options out there, but they do not offer you the six speakers plus the two lower-frequency radiators like this product. The other products also do not come with as many features either. If you look at the power output, this one has the 60W output, and most other options are only 40W. We are impressed that this small soundbar is able to bring you the 60W output, and the sound quality is very much improved because of it. Overall, we feel that this soundbar is the best bang for your buck so to speak. We really love the high-quality sound and design of the product too.